New York Times media columnist Jim Rutenberg's fascination with Russia Today started when he saw several U.S. figures, including Infowars founder Alex Jones and ex-MSNBC anchor Ed Schultz, on the Russian, state-funded TV network. The mixed lineup of U.S. heavyweights piqued Rutenberg's interest. 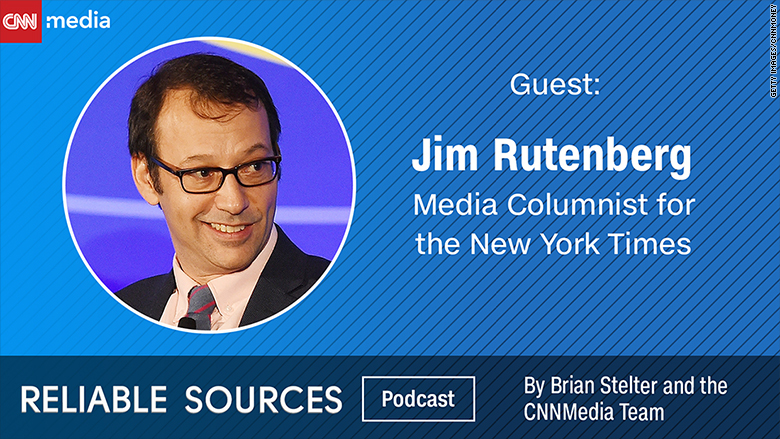 "It's always sort of intrigued me," he told CNN senior media correspondent Brian Stelter on this week's edition of the "Reliable Sources" podcast. "Where does it [RT] fit in our media firmament?" To better understand Russia's media operations, Rutenberg visited the Moscow headquarters of RT and state-owned outlet Sputnik. His reporting-- culminating in his September 17 NYT Magazine cover story, "RT, Sputnik and Russia's New Theory of War" -- took six months to gather and included interviews with Dmitry Peskov, Russian president Vladimir Putin's press secretary, and RT editor-in-chief Margarita Simonyan. Rutenberg laid out the heavy lifting needed required for such a story in this week's "Reliable Sources" podcast, available on iTunes. Rutenberg's article details the origins of RT and Sputnik as part of Russia's aim to, in Putin's own words from 2013, "break the monopoly of the Anglo-Saxon global information streams." "In the Russian view, your network to begin with, CNN, and certainly the rest of us, have been combining with the American soft power and the NGOs to disrupt their part of the world," Rutenberg told Stelter. "So Peskov's view is, 'Hey, we're going to fight back in this information war.'" Rutenberg's piece asserts that Russia's approach has produced an "information weapon" and "the most effective propaganda operation of the 21st century so far, one that thrives in the feverish political climates that have descended on many Western publics." "The essence of that weapon is it's multi-faceted," Rutenberg said. "In the intelligence community's view, RT is part of a broader network that kind of moves its content around social media with other content, and it sort of gets into the fibers of the kind of non-mainstream of American politics, or German politics, or British politics. So, it's kind of the public face of something that goes much deeper." Rutenberg said the Russian media outlets were cooperative in giving him access to their operations. "They were intrigued from the get-go, I think, because I was willing to go to Moscow and I wanted to hear their view of the world," Rutenberg said on the podcast. "And I think it probably helped, too, that I was doing a separate line of inquiry at the Kremlin." Rutenberg described RT's facilities as "modern" and "sleek," but said one of his more interesting discoveries involved its social media executive. "[He] sounds like a social media executive at any news organization," Rutenberg said, "Excited about how they're getting their content out there, on top of all the trends, very happy with their GIF strategy, you know, just on top of everything cutting-edge social in a very open way." The comparisons to other networks go beyond social media, though. Rutenberg says RT's approach to critics is similar to Roger Ailes's explanation of Fox News: "If you thought Fox looked conservative, [Ailes] would say, maybe it's because you were liberal," Rutenberg writes in his piece. RT follows the same kind of look-at-your-own-biases tactic, Rutenberg said told Stelter. "The idea is, like, 'If we look like we ... have such an agenda to you, that's because you're trapped in your sort of Anglo-Saxon media mold,'" he said. "'You're stuck in your own bubble.'" That argument, Rutenberg says, is a "mind boggler." "You have to give some credence to those arguments in general, but, you know, when does it cross the line?" Rutenberg's article on Sputnik and RT is available online at nytimes.com and hits newsstands this Sunday.